I hadn’t watered it since last Friday (before we went out of town), and apparently that was enough time for a mama Robin to pick that spot to build her nest and lay her eggs. I still watered my flowers because I don’t want them to die, but I was really careful not to get any water on the eggs. I also put the basket back up on the hook exactly the way it was. Hopefully mama didn’t get scared off. 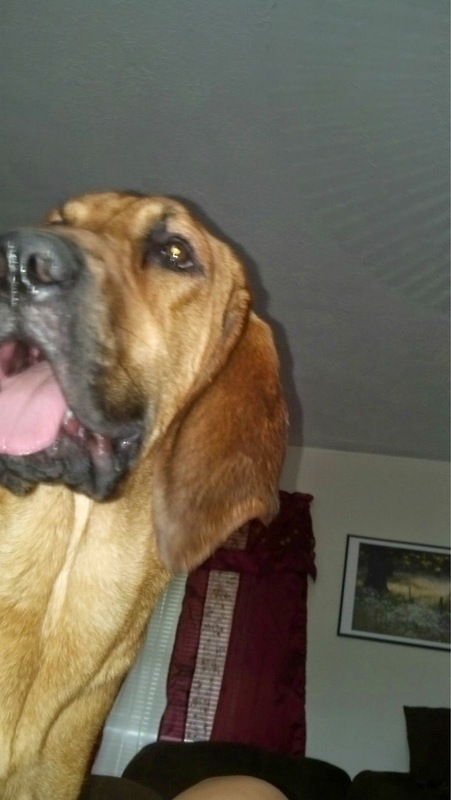 Scout likes to stand over me and lick my face each time I get to the top of my sit up. It makes me laugh, which I’m sure adds extra difficulty. 3. This evening I am making best friends with my foam roller and stick. I am hoping to solve all the problems in my lower legs that arose after Saturday’s long run and rolling my ankles multiple times during that run. My achilles and ankles are still very tight, but getting better. Have you ever had a bird make a nest near your house? 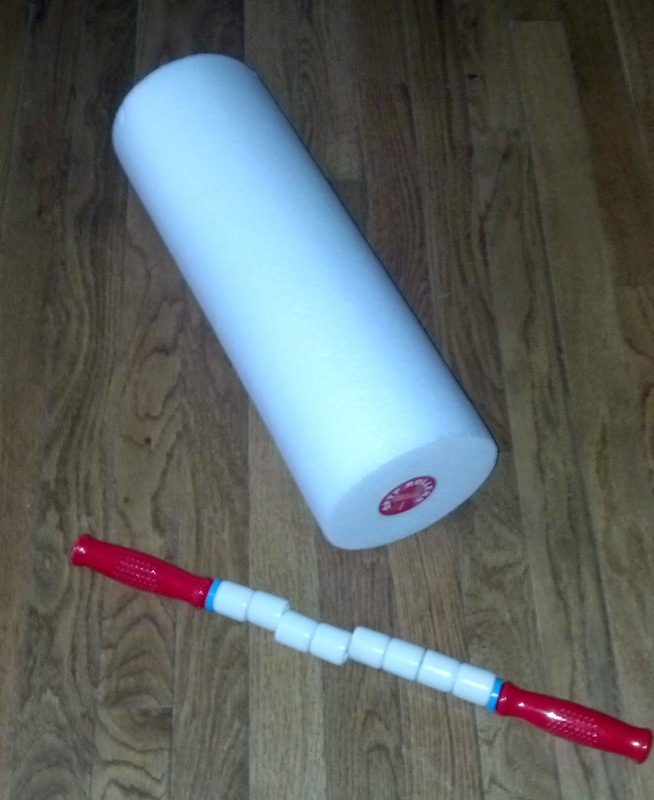 Do you use a foam roller or “The Stick” or something like them? Haha there has been a lot of wildlife on this blog lately! I hadn’t noticed. I have a foam roller and a stick!! I use the stick when I am too tired to do the core workout the foam roller involves. It’s also one of the ways that I can really dig into my calves. The foam roller just doesn’t quite cut it. We used to get Robin’s eggs in a basket that hung above my parent’s hot tub, but one spring I think the mom got spooked and left the eggs. We gave them to the humane society. I hope yours sticks around – how fun! I was worried I had spooked the mama, but I looked out the window this morning and saw her sitting on her nest 🙂 All is well. Can’t answer any of your questions but I do have two dogs that want to lick me anytime I am on the floor for any reason! It’s always playtime when you’re on the floor. That’s the reason I can’t have Hank in the room while I do my Jillian workout. He gets in the way. Scout on the otherhand mostly just sits and watches me. What a beautiful nest. I love robins. LOVE them. It’s funny, when we lived in MI we saw them all the time. I’m certain I took them for granted because just having you mention them makes me nostalgic! I don’t know what “the stick” is!!! I do have a foam roller but I don’t seem to have the attention span to use it for longer than 3 minutes. The stick is that other thing in the picture next to the foam roller 🙂 Sometimes it’s more convenient to use when I don’t feel like rolling myself back and forth on the foam roller. 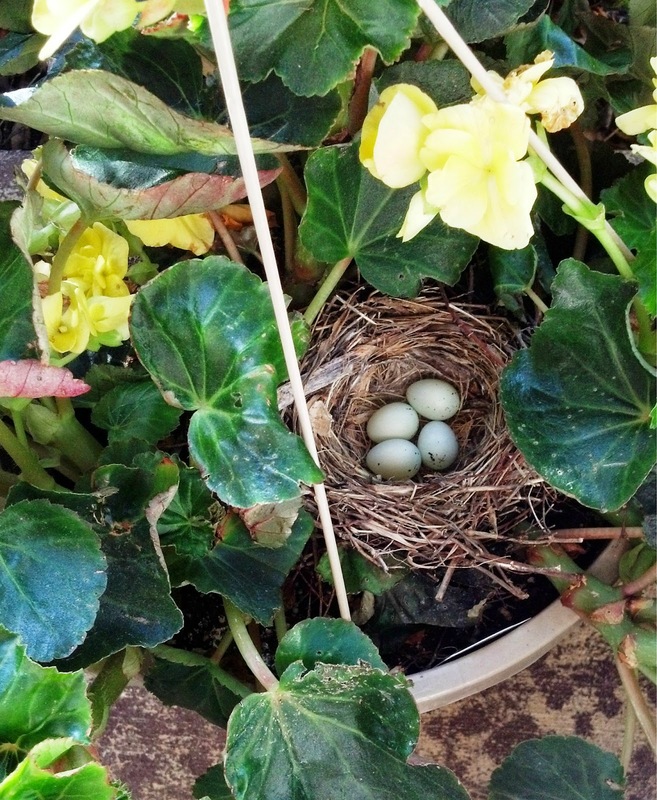 We had a momma bird build a nest in one of our hanging baskets a few years ago. I very carefully watered the flower around the nest all summer. Ironically, the baby birds flew away the day after both Joseph and Daniel went back to school in the fall. I remember posting a picture on Facebook of the little birds and saying that all of my babies had left the nest. I have foam rollers and a stick, too. I bought my stick years ago and love it! Wow that IS ironic! All of your babies left the nest at the same time. My stick was a gift from a friend after I ran my first half marathon. She said now that you’re running a bunch (she ran XC and track in high school) this will be your new best friend. True story.